The region of Shumen covers a high plateau and some parts of the eastern Balkan Mountains. 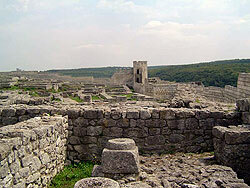 It is very accessible from Varna and Sofia, as it lies on the main route between the two cities. It is also accessible from Istanbul, which explains the large Turkish settlements in the region. A lot of important national and international roads pass through Shumen. It is also crossed by several rivers and has an abundance of mineral springs. A few kilometres away from Shumen City, near the village of Madara, is the Bulgarians’ favourite national symbol: the Madara Rider, a large relief carved into a cliff face depicting a horseman spearing a lion. It is estimated to be around 1,300 years old—perhaps made only a few years after Bulgaria’s founding. There are also some later but no less historical remains in the region, including those of Bulgaria’s old capitals of Pliska and Preslev. The Shumen Pleateau Nature Park protects the wildlife and vegetation of Bulgaria’s highest plateau. Its forests and caves are home to hundreds of plant and animal species, including many rare and endangered ones. Near the centre of Shumen is the Founders of the Bulgarian State, a monument to the seven Slavic tribes that founded the country. Visitors walk through an assortment of stone slabs into which are carved important figures in Bulgaria’s history in a blocky, cubist style and much larger than lifesize. A total of 1,300 steps lead from the city centre to Monument Hill, symbolizing each year of Bulgaria’s existence (the monument opened in 1981). While the country is officially that old, there are even older relics of settlements in the area, including the ruins of a 3,000-year-old fortress overlooking the city on the Shumen Plateau. Shumen’s more recently built attractions include a museum, a large library, a theatre, and a concert hall where symphony performances are regularly held. Bulgaria’s largest mosque, the Tombul Mosque, is here, as is the Shumensko Brewery, one of the country’s biggest beermakers. The Shumensko National Park is a popular place for picnics and hiking.